A few years ago, another parent and I were waiting for our kids to finish a swim lesson when he asked what school my child goes to. I replied that I homeschool. Extremely taken aback, he exclaimed, “But we have so many good schools. Wow, you must be a very picky mom!”. I grinned widely and agreed, “Yes, I am!”. There was no need for that incredulous father to know the backstory about all the traditional options we had researched and tried. There was no need to share that despite being a quick study, my child had had a truly difficult time in regular school. I did not know then where our homeschooling was headed but I did know that it was already helping my child to heal from a bad school experience, grow to love learning, and blossom into a very self-driven learner. I felt truly proud to be a “picky parent”! My son is very gifted in math and reading but did not learn to write a short paragraph, tie shoes, or even climb the stairs easily till much later than most children. Watching him whiz through difficult subjects while struggling with simple life skills, I realized that my own understanding of parenting, education, and traditional timelines had to change and quickly. 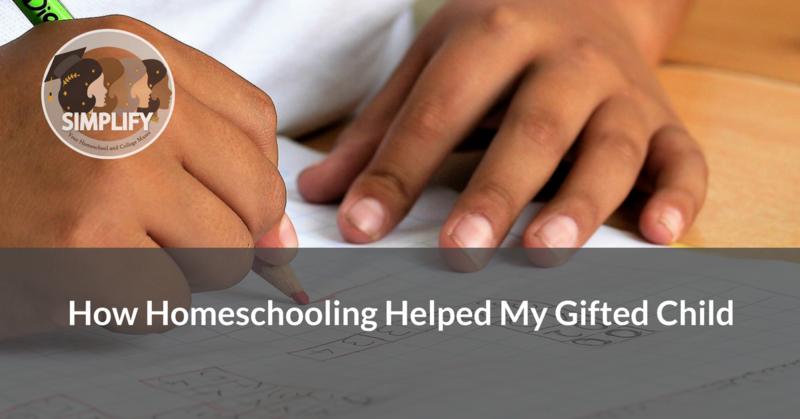 Homeschooling allowed me to fine-tune exactly how my child’s needs were being met. He could devour high school math with a tutor while still in elementary school and read and analyze great literature through the library or college-level lectures, while learning writing and vocabulary through Calvin and Hobbes and various other age-appropriate, laughter-inducing prompts and resources. My son could, as an eight-year-old, take honors-level Chemistry lessons from an aerospace engineer who was passionate about teaching young children. With homeschooling, there were very few age-related educational barriers in my son’s way. With such a personalized approach, I could ensure that my child received a meaningful and rigorous education without the frustration of having to produce output at the same level. Yes, in the beginning, I was concerned about our path. Like any beginner homeschooling parent, I was deadly worried about educational gaps. Gaps are concepts and skills that children sometimes don’t get to at the same time as age peers because they are busy learning other things that they feel are more important to them. As parents we worry that our children will not learn these skills at the same time that school-going children do. Whenever I tried to close up gaps however, I quickly found that my son had already learned many of those skills and ideas on his own, for example, from discussions with a friend, from the TV, through free reading, or simply by observing the world around him in that perceptive way of his. I had to admit defeat with the shoe laces. For the next five years, I bought him shoes with velcro straps. Homeschooling allowed me to customize more than my child’s education. My child yearned to make friends with children and adults who were much older and homeschooling gave the both of us the flexibility to take our inquisitive minds with us everywhere to make friendships with anyone who welcomed us into their communities. It helped us to build a community of our own that transcended age, identity, and social background. For example, my son took jazz piano lessons from a 55-year-old former recreational pilot who regaled him with stories about World War II, planes, and life in the 1960’s and 70’s. At ages 10 and 11, my son discussed the books he read with a much older neighbor while building dams and forts at the playground with children as young as five during homeschool park days. At no point did my child ever feel peer pressure or a need to change who he was. He fit in equally well with seniors as he did with age-mates and five-year-olds. He was able to discuss topics at the levels he preferred with adults who respected his maturity and intellect. These adults did not force him to stop talking about math because it was time for a geography lesson. There was no need to keep his curiosity at bay due to a rigid bell schedule or the confines of an age-based classroom. Homeschoolers are often asked what they will do when they grow up and have to face real life. Try homeschooling for a week and you will realize that this IS real life. It gives any learner the opportunity to be immersed in the community all around them. Our gentler home education approach was also very helpful when my son experienced intense sensitivity, perfectionism, and anxieties that are prevalent among gifted kids. It helped him to be home learning in his own comfortable space at his own comfortable pace and allowed me to be physically close enough to reassure him when he was anxious. To be realistic, homeschooling might not be the cheapest option available to gifted learners. There are many more high quality, free options available today than there were ten years ago. But when you have one parent staying home to oversee the children’s education, homeschooling might be a costlier option for some families than other educational choices out there. When you have children who plow through materials three at a time in the space of an hour or children who demand to go deeper and deeper into a topic that you thought you could finally move away from after ten college units worth of reading and discussions, you are also looking at investing a lot of time and money into choosing more ideal homeschool curriculum. However, homeschooling can still be thousands of dollars cheaper than enrolling your children in schools designed specifically for gifted and talented learners. Depending on where you live, annual school fees will cost as much if not more than annual tuition at a four-year college. To me, the flexibility presented by homeschooling more than made up for the money we spent every year. Thankfully, in California, dual enrollment in the community colleges is highly affordable (or even free for some families). When my son outgrew the challenge I could offer at home, we utilized community college classes, saving even more money. Please don’t hesitate to contact us at Simplify if you are wondering how to start homeschooling a gifted student or struggling to engage your child’s interest in learning. Simplify is a homeschooling and college applications counseling service that is clear, all-inclusive, and fuss-free. We are a four-muse, all-women, multi-talented, and nationwide team. Learn more about Simplify and each muse on our About page. Next StoryCourse Descriptions, Transcripts, School Profile…Oh My!